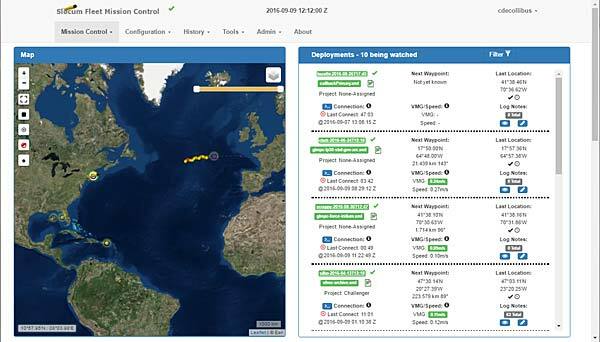 Teledyne Webb Research (TWR), a manufacturer of Autonomous Underwater Vehicles including the Slocum G2 glider and Slocum hybrid glider, has announced the release of their new glider piloting software, the Slocum Fleet Mission Control Software (SFMC). SFMC is a software suite used to manage multiple Teledyne Webb Research Slocum glider deployments around the world. SFMC builds on the traditional Dock Server software application and provides a revolutionary web based front end that allows for collaboration among multiple glider pilots. The new SFMC software suite offers customers some key benefits including active vehicle tracking and mission planning, consolidated data management, the ability to access piloting tools from any platform including tablets and smartphones, and increased security with individual login accounts and multi-level permission sets. The software can be purchased on a yearly license for existing gliders. A one year license is included with the purchase of a new Slocum glider and dock server application. Several packages are available with, and without, data hosting options. The Slocum glider is an autonomous underwater vehicle (AUV) driven by a buoyancy engine capable of long-term deployment for measuring oceanographic parameters. The Slocum G2 glider has a maximum depth rating of 1,000 metres, requires very little power to operate, and can be deployed for as long as one year. The glider’s low logistics, high performance characteristics and modular design make it ideally suited for persistent ocean surveillance using a broad range of available sensor suites. The Slocum hybrid G2 complements the vehicle’s buoyancy drive with a small folding blade thruster to enable additional flight modes and provide the ability to operate in strong water density stratifications and higher current regimes.